It’s the Memorial Day weekend. Take some time to remember the service members who have passed on before us, and get out and enjoy some great events this weekend. A couple of events are taking place Thursday, including a community event in Richmond to celebrate Emergency Medical Service personnel. Come thank the people who help us in our worst time of need, starting at 7 p.m. Thursday at the Richmond City Park. Join Gail Miller and the United Way at “A Legacy of Giving and All That Jazz.” The annual fundraising dinner for the United Way of Cache Valley is at the USU Ballroom starting at 6 p.m. on Thursday. The proceeds from the evening will benefit 17 local non-profit agencies. Also on Thursday is Helicon West, it’s an open-mic night starting at 7 p.m. in the Bonneville Room of the Logan Library. Creative writers are encouraged to share up to seven minutes of their original works. It’s free, open to the public and uncensored. Speaking of original works, the 8th annual KSM Songwriters Competition continues this weekend. Starting at 1 p.m. performers will share their songs and the top 6 will perform again on Monday, also at 1 p.m.
Monday is Memorial Day and, just like any good holiday in the summer, it starts out with a breakfast from a service organization. The Hyde Park Lions Club is hosting an all-you-can-eat breakfast from 7-10 a.m. at the Hyde Park City building. Proceeds from this year’s breakfast will benefit a middle school teacher from Hyde Park currently battling cancer. The Hyrum City Museum is hosting a Memorial Day Open House from 10 a.m. to 1 p.m. Visiting the museum is a great way to connect to your past. 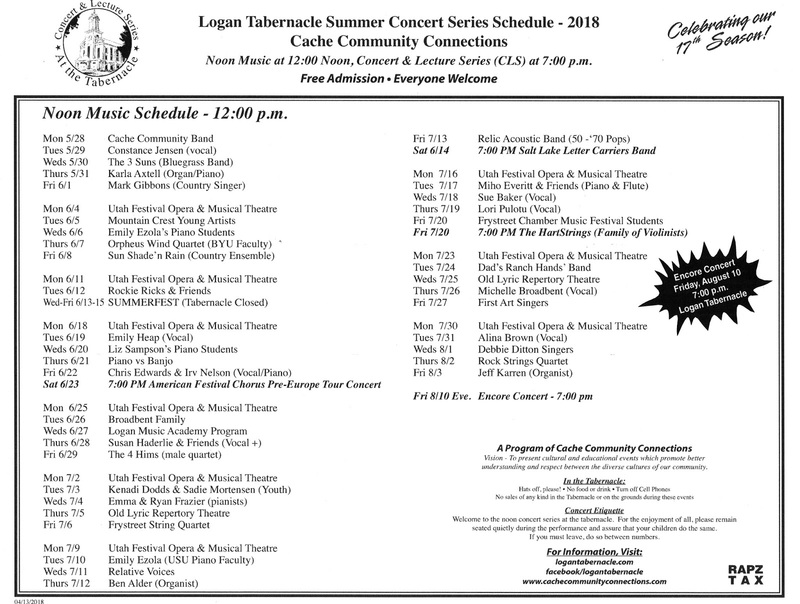 The Cache Community Band kicks off the Logan Tabernacle Summer Concert Series on Monday. The concert is at Noon and is free. Concerts will take place every weekday at noon in the Tabernacle throughout the entire summer, except during Summerfest. Cemeteries will be busy on Monday with Memorial Day. While you’re out enjoying time off with family and friends, take a moment to honor the members of the armed services who died while serving our country. We thank them for their service and their sacrifice. And a special thanks to those who plant flags and work to make their grave stones beautiful.